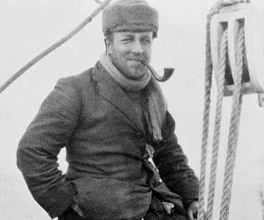 Sir Douglas Mawson was an English geologist and the pioneer of Australian Antarctic exploration. He was the leader of the Australian Antarctic Expedition (AAE), which set out to chart Antarctica's coastline. Mawson was born in England in 1882, and moved to Sydney with his family in 1884. After studying mining, engineering and geology, he went on to become a lecturer in mineralogy and petrology at the University of Adelaide in 1905. In 1907, Sir Ernest Shackleton invited Mawson to join the British Antarctic Expedition, which aimed to reach the South Magnetic Pole. This was the starting point for Mawson's lifelong association with the Antarctic. In 1911, Mawson left for England to raise funds for Australia's first Antarctic expedition. With Shackleton's help, he raised the funds he needed and purchased the ship Aurora to take his party to the Antarctic. This expedition was successful, and saw the establishment of a scientific base on Macquarie Island, and a main base on Commonwealth Bay in Antarctica. Outside the bowl of chaos as brimming with drift-snow and as I lay in the sleeping-bag beside my dead companion I wondered how, in such conditions, I would manage to break and pitch camp single-handed. Mawson, D 2000, The home of the blizzard: a true story of Antarctic survival, Birlinn Limited, Edinburgh. Mawson's heroic expeditions to the Antarctic led to the inclusion of his portrait on the Australian 100 dollar bill. After recovering, Mawson continued his scientific work in Antarctica until early 1914, collecting so much data that his reports weren't finalised until 1947. His last expedition was in 1929, when he led the British, Australian and New Zealand Antarctic Research Expedition. Sir Douglas Mawson died in 1958, but his contribution to Antarctic exploration will never be forgotten. He is remembered as a man with a true commitment to his science, and one of the most outstanding explorers of the 20th century. Years of Arctic navigation made the Aurora worthy of being the vessel for Australia's first Antarctic expedition. Lesser known than his fellow explorers, John King Davis was one of the quiet achievers of Australian Antarctic exploration. Although catastrophe seemed to follow wherever he went, Ernest Shackleton was a pioneer of Australian Antarctic exploration.